Let’s face it life is hard. No one gets out of it without ever going through rough times. There are others unfortunately that have it rougher than others, some of it from their own doing and some of it they have no control over. We have a psychological process that gets us through these times. This process allows us to grieve, be sad and or angry. Then as time goes on the feelings lessen until they may still be there but our subconscious can deal with it and it just becomes part of who we are. We go on with our lives. There are some however, that either have multiple bad things happen at once or just simply aren’t able to work through the process that we are internally given to get to a better place. There is nothing wrong with that. It is important that everyone know when that is happening to them. One must know when to ask for help. There is a rise in suicide in this country and the tide seems to be from the inability to cope with loss, illness, loss of self worth, and mental illness. These individuals don’t turn and ask for help. They don’t know where to go. We are told by the author of Matthew, in 11:28-30 (NKJV): “come to Me, all you who labor and are heavy laden, and I will give you rest. Take My yoke upon you and learn from Me, for I am gentle and lowly in heart, and you will find rest for your souls. For My yoke is easy and My burden is light.” He is telling us, come to me, tell me everything, let me take that burden from you so you don’t have to worry about it any more. The Lord is telling you “I got this!” Why are you hesitating? Do you like being sick and lonely; do you enjoy carrying that weight on your shoulders? Throughout the Bible, the Lord is telling us that he wants our burdens. He knows our road is rough and hard to travel and He gives us a way to lessen our burden. Just in our physical life, God has always provided a way for man to lessen his burdens, such as pack animals, then automotive equipment, and new technologies. He gives us a way to make our life easier. He does the same spiritually or mentally also. Psalms 55:22 (NKJV): Cast your burden on the Lord, and He shall sustain you; He shall never permit the righteous to be moved. Hebrews 4:16 (NKJV): Let us therefore come boldly to the throne of grace, that we may obtain mercy and find grace to help in time of need. 1Peter 5:6-7 (NKJV): Therefore humble yourselves under the mighty hand of God, that He may exalt you in due time, casting all your cre upon Him, for He cares for you. The only thing that stops us from seeking help is ourselves. Our pride stands in the way from asking God for help and giving our burdens to him to deal with. There is no shame in asking for help. God commands us to be humble in James 4:10 Humble yourself before the Lord and He will exalt you. Give it to God. He can handle it. Have a blessed day and be humble. God expects us to live our lives as servants and to put others before ourselves. In Philippians 2, Paul is speaking to Christians in Philippi and is telling them that if they are to find any comfort in Christ or being a Christian they must be of the same mind or attitude and find fellowship and love as one but they must NOT (v3) “let nothing be done through selfish ambition or conceit, but in lowliness of mind of let each esteem others better than himself. Let each of you look out not only for his own interests, but also for the interests of others.” So in Philippians 2: 3-4 Paul actually gives us the definition of humble. Just remember that as Christians we are here to serve God, learn from God, and love God. It is our job to teach his message and one can teach through word and deed. Have a Blessed Day and may you remain humble. Is My Baptism Still Valid? Have you ever asked yourself if your baptism is still valid? Do you ask yourself if you fully understood what you were committing yourself to? For those that are raised in the Church, the majority of us were baptized at a fairly young age such as 12-16 years of age. It was at that time that we felt we knew right from wrong and understood the lessons we were hearing about God, Jesus and the Church. It is the time that James speaks to the First Century Church telling them in v.17 “Therefore, to him who knows to do good and does not do it, to him it is sin.” Jesus said of the blind in John 9:41 “If you were blind, you would have no sin; but now you say, “We See”, Therefore your sin remains.” What we are being told here is simple, if you hear the word, believe it and know right from wrong then God will hold you accountable on the Day of Judgment. He doesn’t expect you to know everything there is to know; but he does expect you to take responsibility for your life and continue to learn and grow. Is it true that as years pass and one becomes wiser with life, that how we view things changes? Of course it does. We change our perspective. We begin to understand and realize those things we were taught in our youth. Just because we are learning and growing does not mean our baptism or commitment to God is null and void. Just like the love of our earthly parents, God’s love for us grows and changes form and nurtures us. God provides us a way to ask for forgiveness and to make our lives right in his eyes. It is called repentance. Paul tells the Christians in Rome in Romans 3:21-26 that God sent Jesus to prove to the world that he was offering them a plan of salvation and saving Grace because (v23) “for all have sinned and fall short of the glory of God” (v24) being justified freely by His grace through the redemption that is in Christ Jesus.” God tells us to say we are sorry and act accordingly and he will forgive us our sins. In order to be saved, one must hear, believe, confess, repent and be baptized. Jesus suffered for us. It was not an easy task that God gave Him. He did not take away Jesus’s pain and suffering because if He did, then the sacrifice would not have meant as much. 1 Peter 3:18-22 tells us “For Christ also suffered once for sins, the just for the unjust, that He might bring us to God, being put to death in the flesh but made alive by the Spirit, by whom also He went and preached to the spirits in prison, who formerly were disobedient, when once the Divine longsuffering waited in the days of Noah, while the ark was being prepared, in which a few that is eight souls, were saved through water. There is also an antitype (The Bible is telling us that baptism is a symbol representing cleansing or washing away) which now saves us-baptism (not the removal of the filth of the flesh, but the answer of a good conscience toward God), through the resurrection of Jesus Christ, who has gone into heaven and is at the right handoff God, angels and authorities and powers having been made subject to Him.” Peter is using the story of Noah as a representation of baptism in that all on the earth was washed away except for the righteous 8 that God had saved and through baptism, we can have our sins washed away and our soul saved through God. Have a Blessed day and stay humble. God’s purpose for my life is simple; it is to live a good and faithful life and helping those in need. In the Book of Matthew, during the Sermon on the Mount, Jesus delivers The Beatitudes. It was this lesson that brought me to my calling of being a nurse. Matthew 5:5-7 (New King James Version) “Blessed are the meek, for they shall inherit the earth. Blessed are those who hunger and thirst for righteousness, for they shall be filled. Blessed are the merciful, for they shall obtain mercy.” I find I am able to serve God by serving those who are sick, weak, poor and underserved. I do not find it hard to live the life God has given to me. I love helping others and I have learned to love to teach others about God and his plan for us. On the Sermon on the Mount in Matthew 6: 25-34 (NKJV) Jesus tells us not to worry about worldly things. God will take care of the small things. He will make sure we have what we need just as Jesus used the birds as an example. He stated in verse 26 “Look at he birds of the air, for they neither sow nor reap nor gather into barns; yet your heavenly Father feeds them. Are you not of more value than they?” So believing this, allows me to live the life God has intended. As we go through our day, how often do we think of our conduct? Are you aware of what you are doing or how you are acting? Better yet, are you aware that people are watching you? Unless you are in a room all by yourself, someone is watching you. It’s human nature for us to watch others. I think the common term for it these days is “People watching.” Does this thought make you nervous? It should. What does that mean? Paul and Timothy are telling their fellow Christians that they should be mindful of their conduct so that if people are going to talk of their conduct, it will be of good works and will bring their faith to the forefront. We should strive to be examples to those around us. They should look at us and know that we follow Christ and strive to live a good life. In 1 Timothy 4:12 we are told to be an example in our conduct, love, spirit, faith and purity. When people think of good character and good conduct, they should think of you. They say the biggest form of flattery is impersonation. How great a thing to be someone that people look up to and strive to be like. Several versus in the New Testament speak of showing good conduct so that others may see you as meek and wise (James 3:13); having your conduct honorable so that people may see whom you serve, and glorify God (1 Peter 2:12); turn away from evil and do good (1 Peter 3:11). Have you ever had one of those days where you jump out of bed because the alarm didn’t’ go off or you hit the snooze too many times? So you jump up, put a pot of coffee on and start getting ready for your day. In your hurry you run over pull the coffee pot off the burner just to have coffee spill all over the counter because it wasn’t done and in your hurry you didn’t look? So you clean that up, pack your lunch, grab your coat and keys and head out the door. As you are backing out the driveway you look down and there is no lunch. So you stop, go back into the house and get your lunch and look to the sky and say “Why me, Lord?” Then you head off to work to start your day and then sometime around lunch you can’t remember If you shut the coffee pot off. I think most of us have had days like this. Days where we wish we could start over. Days where we just need a time out to restart our day. Devotional is defined by Merriam Webster as a short worship service. Take time to worship God. It doesn’t have to be long just loving and sincere. Make it easy on yourself, pick a few Bible verses, write them down and leave them in your lunch box, purse, desk drawer, tool box or whatever you have available and pull them out and read them, think about God’s message and just re-center yourself. 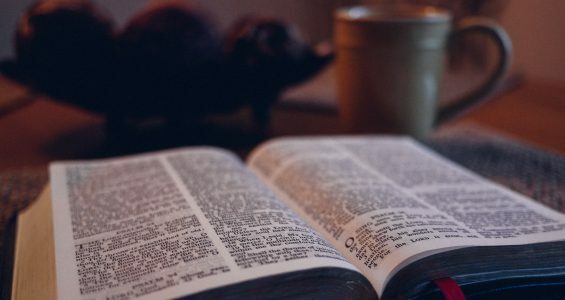 Why are daily devotionals important? They allow us to “put on the whole armor of God, that you may be able to stand against the wiles of the devil.” Ephesians 6:10-18 (NKV) tells us this. Paul tells us to arm ourselves with the belt of truth, breastplate of righteousness, feet fitted with readiness from the gospel of peace, shield of faith, helmet of salvation and the sword of the spirit. These things we will need to conquer life and live as he commands. Sometimes we have to remember our spiritual clothes. It is easy to get busy in this life and not take the time for God and ourselves. So take a few minutes every morning or evening and devote sometime to the one who deserves it. He will calm your nerves and still the waters around you. He will give you peace to get you through the night and the strength to get you through the day. He has equipped you with the armor you need and the gospel so that you might meet all challenges head on.